Sunday 2.00 pm - 5.00 pm. This prestigious institution is where you'll find Australia's largest provincial collection of Colonial Art, a display of the State's vast mineral wealth and distinctive flora and fauna including the elusive Tasmanian Tiger; a complete Chinese joss house from the tin mining days of the 1890s and a spectacular Planetarium. The new $8M site at Inveresk is superb! Best presentation in Australia of exotic automobiles. You can view cars being restored in the internationally-renowned workshop. Housed in an historic building in City Park, the centre promotes and sells works by Tasmanian designers with a major focus on contemporary furniture. 9.00 am - 5.00 pm seven days a week. A fine example of a charming Georgian house, typical of the period. It was built in 1838 for Mr Britton Jones, an early Launceston brewer and innkeeper. Features outstanding interior woodworks, tearoom and gift shop. Tours depart from the Tasmanian Travel and Information Centre - Launceston Monday - Friday 9.45 am, other times and tours by appointment. Fascinating walks around the historic churches and inns of the city capturing the history, colour and character of the past and imparting an understanding of the architecture for which Launceston is famous. Historic parkland featuring monkey island, conservatory, duck pond, senses garden, barbecue area, playground, Albert Hall Convention Centre, Design Centre of Tasmania and City Park Radio - a community FM station. Brochure is available from Henty House and from all information centres in the area. Sitting in the hills of West Launceston and by the South Esk River, the 450 hectare recreation area offers all the excitement and exhilaration of cable hang gliding, bushwalking, archery, orienteering and aquatic activities or the quietness and relaxation found amid the spectacular gorges, river, lake and eucalyptus forests. Less than half an hour drive from the centre of Launceston is Tasmania's premier wine growing area - the Tamar Valley. 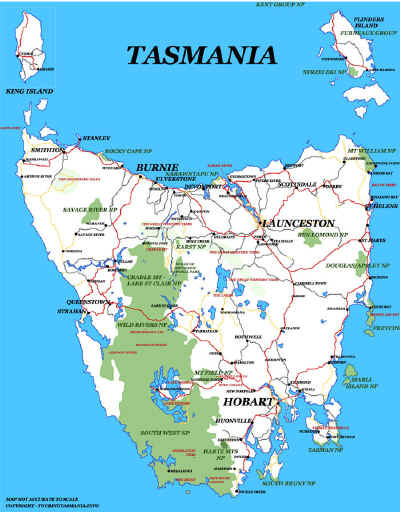 Here you'll find the orchard, farms and wineries for which Tasmania is famous. This is where the acclaimed cool-climate wines are grown and because many of the vineyards are small and family-owned the growers themselves will greet you and explain just how the wine is made. The best way to access the Valley is to get a copy of the 'Tasmania Wine Route Guide', available free from the Tasmanian Travel and Information Centre. The site will incorporates the Queen Victoria Museum and Art Gallery, the University's School of Performing and Visual Arts, the Royal Launceston Show Society, parklands, waterways, walkways and cycleways.